More and more I feel violated as a consumer when I buy a game from a major company. Whether you can only get the real ending to a plot in downloadable content you have to pay for or you’re only getting 80% of the content that’s already on the disc at full price while being charged extra for the last 20% – it seems that a game company’s only objective now is to bleed out every drop of profit from as many places as much as they can. Don’t get me wrong, I get why developers do this. With the costs of developing a game and publishing them onto a console being as high as they are and with the used game industry siphoning away a ton of potential profits from a game (especially when people sell back their new games en masse just days after buying them), game developers have to find ways to maximize profits from every avenue possible to even stay in business. One glance at this list of game studio closures since 2007 is enough to show what a shaky market they’re in. There are so many industry wide problems that cause this economic dilemma, though, that it’s not something that can be fixed overnight. Only a major change or a gradual shift away from the norm can do that. Regardless, more and more players are becoming frustrated with these business practices, and they’re buying games from major companies less and less. Super Meat Boy, one of the most successful indie games of all time (as of January 2012, they’ve hit the 1,000,000 mark), cost around “$30,000” to make. According to developer Edmund McMillen, though, “we would have spent that even if we weren’t working on the game, so the real dev cost is closer to $0.” Whereas some major developers can take up to five or six years to produce one game, Super Meat Boy only took a year and a half with just a two man team whose only “expenses” were to pay rent. Less costs to produce and less time to develop = higher returns. And with cheap production avenues like Steam or self-financing sites like Kickstarter now available to replace those high publishing and financing costs of publishing a game through a major publisher – indie developers have even more ways to gain a profit than ever before. Granted, no indie game will be pulling Call of Duty numbers, but still. Very few entertainment industry pros do. A future indie game developer rich off that sick indie cash with his mean-spirited trophy wife. The more something costs to make, the less risks it can take. This applies to any industry, but with video games especially. A lot of major games released today only copy other successful games while imposing subtle changes to make it “unique.” Games made on a much smaller scale don’t gain as much from copying a major game. They don’t have the production value to do it and, at best, they can only come off like a really good cover band does when you’re kind of drunk at a bar. The thing that distinguishes one indie game from the rest is creativity, and it’s this that’s valued above all else. 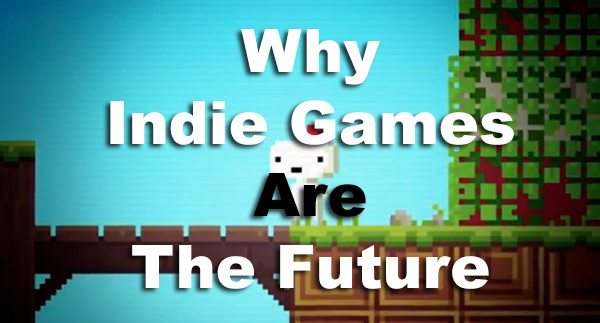 Indie games have to be creative because if they weren’t, no one would pay attention to them. 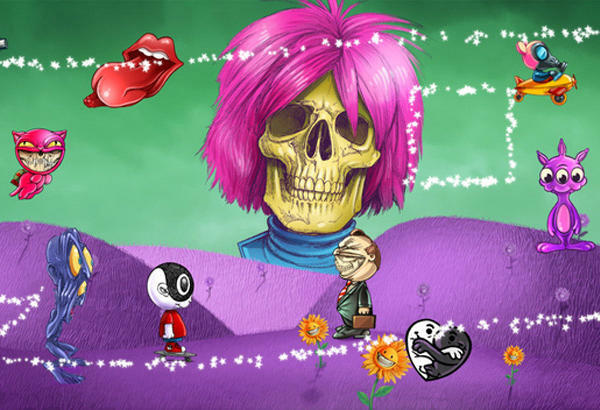 To be unique involves taking risks, and it’s these kind of risks indie games can afford. Something new and creative can make gaming feel fresh again. This exists by a freedom of creativity. There was a time when graphics were a game’s main selling point. If a game had archaic looking graphics, it would never sell and the critics would tear it apart mercilessly. Fortunately, though, technology has advanced to the point that a small developer can make something look appealing with just a limited set of tools and with low scale graphics. While an indie developer will never make something on the scale of Metal Gear Solid 4, they can still design their game with a certain aesthetic that can be just as, if not more, appealing than something from a major company. 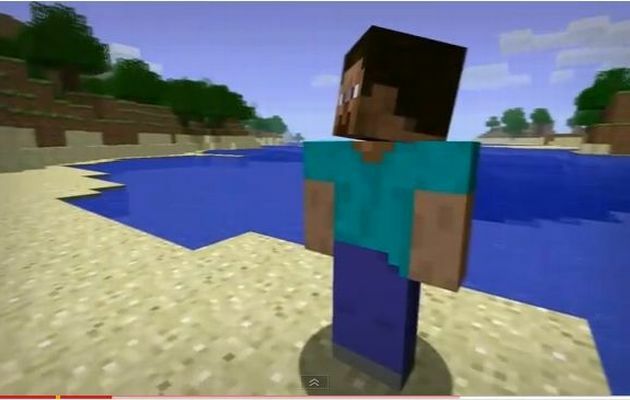 Minecraft, with its blocky design (that feels more at home with a mid-90’s 32 bit era game trying to emulate 3D graphics than a game from the 2010’s), has, by definition, pretty terrible graphics. Regardless, it’s not about the quality of its graphics that makes it a great looking game, it’s about the individual aesthetic it has with its retro design. Grand Turismo 5 is a hyper realistic looking game that came out in 2010 and that nobody really cares about now. Minecraft is a game that looked 10 years outdated when it came out in the same year and is still played by a rabid fanbase now. Minecraft Guy: Still breaking hearts. People hate the idea of big business. Even though this doesn’t stop them from supporting it in droves, a lot of people don’t like to be reminded how many faceless corporations control their lives. The same idea applies to video games. Gamers develop personal relationships with their favorite games just as much as anyone else does with any other medium of art, and when their games are changed or ruined in a sequel or an update, that personal relationship starts to fade. An indie game developer is a person who has complete and total control of their work. People are much more willing to invest in something that they know they can develop a personal relationship with and call “their own.” Indie game developers don’t have to worry about answering to a board of investors or always looking at the bottom line, all they have to worry about is making a great game. And when so many video game developers are easily accessible on places like Twitter or Tumblr to talk about their work with you, a video game feels less like a business product and more like an artistic venture. See? 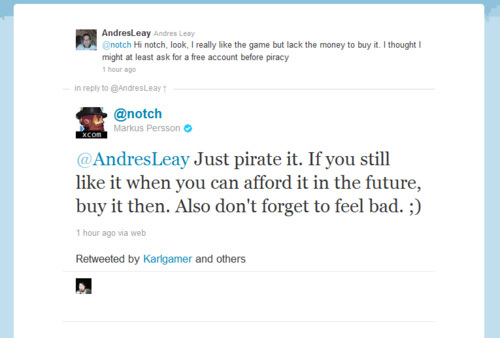 The guys who made Minecraft are pretty cool. Just like Nirvana did to alternative and indie culture in the 90’s, when something new, revolutionary, and successful comes along during a time when regular business is failing, businesses are quick to try and replicate this new thing or find more things like it. While this eventually bastardizes the creative spark that started it just like Nirvana’s grunge sound led to bands like Creed – it stills leads to two or three golden years of creativity as companies take more chances and invest in things they wouldn’t have before. While the game industry isn’t bloated enough just yet to reach its tipping point, the time is coming soon that it will start favoring creativity over business for once.